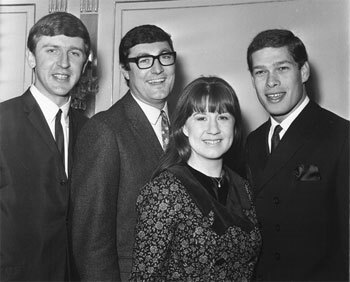 The Seekers were a much-loved folk group that formed in Melbourne in 1962 and went on to over sell over 50 million records. The Seekers enjoyed hits including I'll Never Find Another You, A World of Our Own, The Carnival Is Over, Someday One Day, Walk With Me, Morningtown Ride*, Georgy Girl, When Will the Good Apples Fall and Emerald City. Morningtown Ride is not connected with the Melbourne suburb of Mornington. It was written by American Malvina Reynolds in 1957. They were the first Australian popular music group to achieve major chart and sales success in the United Kingdom and the United States. The Seekers were formed by Athol Guy, Keith Potger and Bruce Woodley, who all attended Melbourne High School. Judith was in Essendon and recorded an EP with the Melbourne group Frank Traynor's Jazz Preachers. After spending 3 years in the UK, in March 1967, The Seekers returned to Australia for a homecoming tour, which included a record-breaking concert at the Sidney Myer Music Bowl attended by more than 200,000 people. The Seekers were accompanied by the Melbourne Symphony Orchestra, conducted by Hector Crawford. This concert was listed in the 1993 Guinness Book Of World Records as the largest concert crowd ever gathered in the southern hemisphere. Vision of the appearance was incorporated into their 1967 Australian television spectacular The Seekers at Home and Down Under, which was screened on the Seven Network and drew a record rating of 6,070,000 and it still remains in the Top 10 Most Watched television specials in Australian history. From their farewell concert in London July 7 1968.